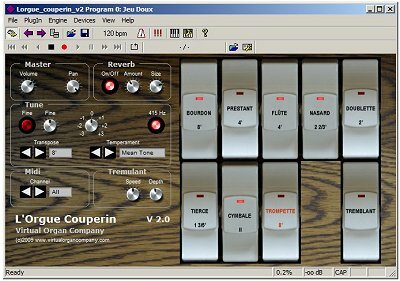 L'Orgue Couperin is the latest addition to the collection of VST virtual pipe organs from Virtual Organ Company. This organ is ideal for the performance of French baroque organ music, such as that from Francois Couperin. Like all other organs from VOC, this organ doesn't use any samples but very sophisticated additive and subtractive synthesis to create the very realistic sounding voices. As a result, the module is very small (only a few megabyte) in size, so it loads very quickly and the latency is negligible. This 4’ organ is typical of its time and its base voices are a very rich sounding Bourdon 8’ and a beautifully stringy Prestant 4’. Despite only having 8 voices, this organ has no less than 3 mutation stops, including a Tierce 1 3/8’ and an intense Cymbale II, which make this instrument truly sound very big indeed. There is also a Tremblant. The Positief III also features a choice of temperaments including Equal Beat (modern standard), Pythagorean, Arnout, Mean Tone, Rameau, Kirnberger 3, Werckmeister 3, Vallotti, Young, Silbermann and Lehman (Bach). Using these temperaments allow you to re-create the sound of the organ as it was in bygone years. The tuning of the organ can also be switched instantaniously between a=440 Hz or a=415 Hz. A free demo version is available of this organ to try before you buy. Just click here to donwload it and follow the instructions that come with it. You can purchase the full version for only £40 by clicking the button below. Please visit our shop for collections of organ plugins and save money!